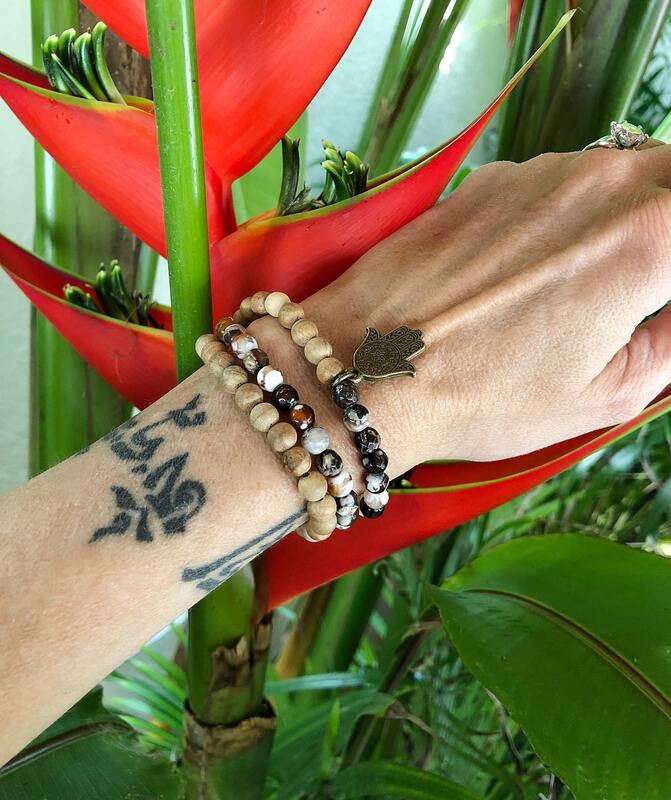 The Sandalwood Dream Triple Wrap Mala Bracelet features lovely faceted Agate gemstones along with authentic Sandalwood, a Salwag palmwood seed bead and a reversible brass Hamsa hand for an earthy organic bohemian feel. It has strong grounding properties and may help alleviate stress, calm emotions and help you relax. 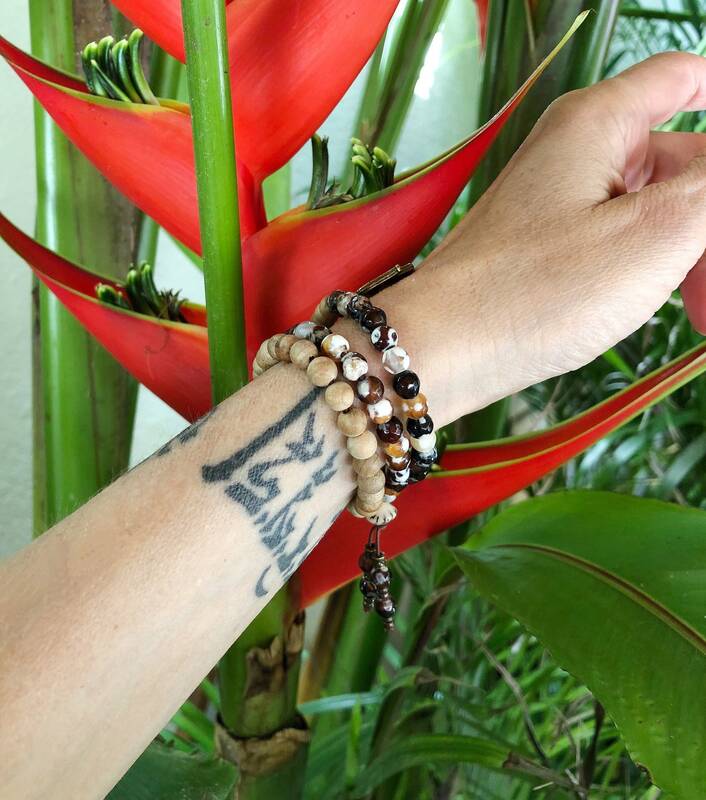 This one gently wraps around the wrist three times for a bold boho look and triple the healing vibrations. Sandalwood is one of the most valuable woods in the world, used in Buddhist culture for thousands of years. It is believed to have a certain magical power that offers protection, enhances meditation and increases clarity. Sandalwood stimulates the root chakra to infuse feelings of safety and tranquility, and to enhance self-esteem and self-identity. In the Ayurvedic healing tradition, it promotes success, energy and enthusiasm, increasing a person's zest for life. Agate is one of the oldest gemstones in recorded history, used in jewelry since Biblical Babylonian times. These gems work with all chakras to bring love, abundance, good luck, longevity, acceptance, courage, strength, protection, balance and harmony. Agate gently realigns the mind, body and spirit. It soothes emotions, heals inner anger and protects from stress and energy drain. The symbol Hamsa, also known as the Hand of God, is an ancient symbol of protection, bringing its wearer happiness, luck, health, peace and prosperity. 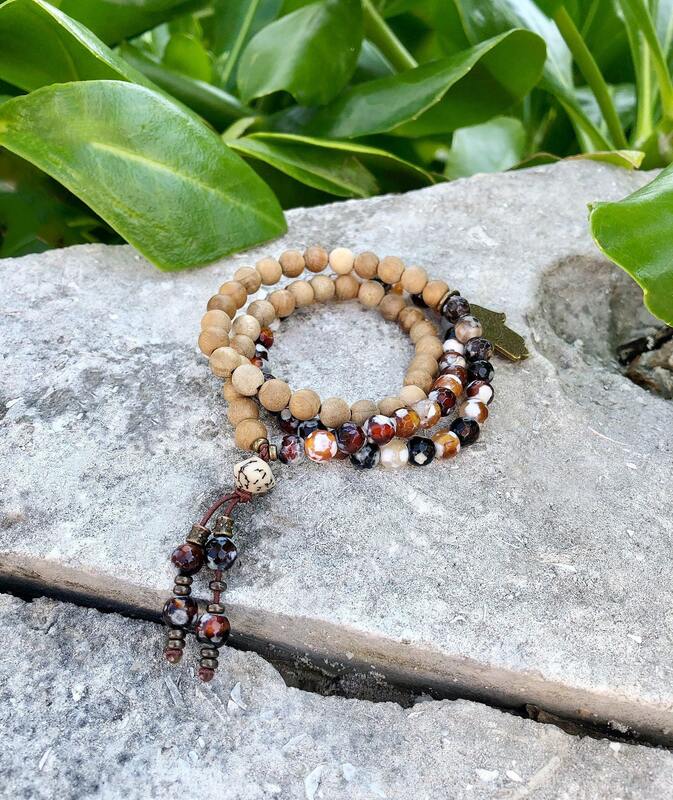 6mm natural gemstones and sandalwood, strung on strong elastic stretch cord. One size fits most wrists. Custom sizing is available.